Looking for a fun hobby that is also “profitable”? If you love nature and toxic chemical fumes, taxidermy–the art and science of stuffing (dead) animals–may be just the thing! 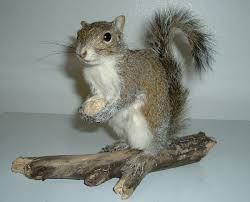 Here are queries Mr. Taxidermist pulled at random from his mailbag this week. This won’t seem like a question that’s “up your alley” “right off the bat,” but here goes. 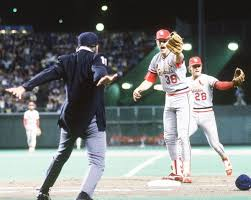 I have not had much success in love, as my last serious relationship ended when Don Denkinger blew that call at first base during game six of the 1985 World Series between the Kansas City Royals and the St. Louis Cardinals. I apparently did not get upset enough for my boyfriend, Luke Swingarth, who was totally beside himself, and wanted me to share in his grief. This I could not do, as I don’t like sports except for water skiing and bowling. Anyway, I recently met a nice man at work, and I could tell there was “something special” between us right away. He is a real gentleman, holding the refrigerator door open for me in the employee lounge at Applied Widgetronix. To get my lunch, I mean, not to go into the refrigerator. I have heard that the Chinese symbol for “opportunity” is the same one as for “problem,” and that is sort of my dilemma. 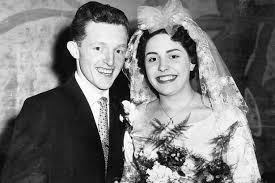 “Ron” is available because he’s a widower so that’s my opportunity, but his problem is that he still isn’t over his late wife Earleen. 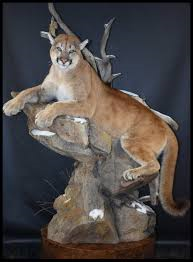 He had her stuffed and mounted in a pose that is sort of like the resting mountain lion trophies you sometimes see in sporting good store windows, but instead she is reclining on the divan out on his screened-in porch. 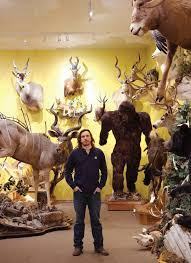 Mr. Taxidermist, I have asked several of my girlfriends for their opinion, and they all agree “Ron’s” commemorative display is strange bordering on creepy. How can I gently persuade him it is time to drop off “Earleen” in the “take-it-or-leave-it” section of our town dump so she can find a new home and I can move in. I don’t know what you hoped to accomplish writing a letter to a licensed taxidermist calling his profession “strange” and “creepy.” Taxidermy is a wholesome indoor sport with some outdoor overtones that is undergoing a long-overdue revival, as young women muscle in on it the way they have with business, the professions, and sexual promiscuity. Maybe if you got your nose out of the air and came “down-to-earth” with the rest of us ordinary Jacks and Jills you might find taxidermy a relaxing if smelly hobby you could share with Ron. Mr. Taxidermist, I was under the impression that taxidermy was painless to animals, as they are dead when state-of-the-art preservation techniques are applied to them. 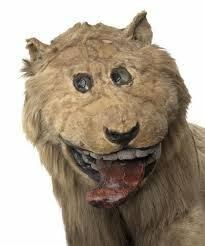 Is there an informational brochure you could send me that I could refer to so as to rebut anti-taxidermy sentiment? Thanks for asking! The American Taxidermy Association has a wide variety of “propaganda” you can give to your skeptical friends, including “The Truth About Taxidermists,” “Preserving Your Furry Friends,” and for kids “Stuffed!” by Ricky the Dead Raccoon. Legal says I have to add this disclaimer: With the exception of lemmings, which are suicidal, most animals are unwilling participants in the hobby of taxidermy. I have a bone to pick with you. I bought your Home Taxidermy Starter Kit and tried it out on a dead squirrel I found Saturday on Highway 70, just south of Aullville. “Rocky” turned out okay for my first try, just a little lumpy around the middle, but I had hallucinations for the better part of the weekend, and cried out that I could see the face of God during my Sunday school class at our Lutheran Church, where ecstatic expression of religious fervor is strictly prohibited. I was reported by Clara Smithy, mother of one of my students, and as they say butter wouldn’t melt in her mouth. Now I am on three months’ probation and my name is mud throughout the entire Missouri Synod. I think you should have a warning about possible “psychedelic” experiences on the package, and am reporting you to the Federal Food and Drug Administration. Sorry, but the good old First Amendment gets us out of this one. I didn’t tell you to go to church to exercise “freedom of religion” after using my proprietary mixture of secret ingredients to dry out “Rocky’s” skin. These include alum, which you have probably used if you’ve ever soaked cucumbers to make pickles. Still, in an effort to keep the plaintiffs’ lawyers off my back, I will offer you a merchandise credit on your purchase of “Home Taxidermy Pro,” a $14.95 value, which is recommended if you are to move on to larger animals such as weasels. Just remember not to eat the leftover innards unless you marinade them in formaldehyde and cook on low for three days in your Crock-Pot.